Last week, Wednesday through Friday, Ray went to Vegas for prospecting school. 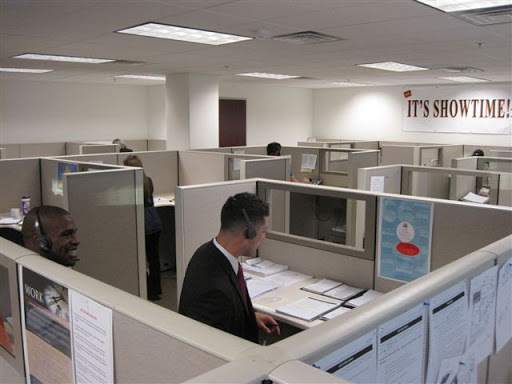 Prospecting school is an organization made by Mike Ferry where you are with a group of people, each person gets a cubicle and you just call potential clients from 9am-5pm. They call for sale by owners, expireds, and just listed/just sold homes. Ray already does this religiously Monday through Friday to get new clients, but the cool thing about going to prospecting school is that you can tap into the other persons call and listen in on their conversations and hear how they handle things with potential clients, and how they pursue them to list their home with them. ( I think this is so cool, because you listen in to the other persons conversations and get other ideas on how to talk to your potential clients.) Even though its not so much about persuading, but being honest, helping people accomplish their goals to buy or sale, doing your homework and really knowing whats going on in the market. Which Ray is always doing his homework, and he is way on top of everything! He is such a great Real Estate agent! I am not just saying this because he is my husband, but because he really is trust worthy, a hard worker, and he doesn’t stop until he finds you the perfect home for the best deal or sales your home for top dollar! This is Ray’s career, he doesn’t do it part-time, he is fully focused 100% on Real Estate. ( I know I am going a little out of the subject now, but I cant help but to brag a little about my hubby… hehe). Lets put it this way… If you are going to get surgery done, do you want a part-time surgeon to perform the surgery on you or do you want someone who is full-time who does it every single day? It’s kinda like an agent too, do you want someone that does it here and there or someone who knows the market inside and out, since that’s what they do every. single. day. hahaha… I have no clue why I went this far, but I did! OK, so where were we?! Oh, yes… prospecting school! Ray goes to prospecting school about 4 times a year, and there is always different people so you can always get/hear new ideas on how they talk to potential clients. Not only that, but the environment you’re in… everyone there is motivated on calling and getting clients, and you feed off of everyones energy. This is why Ray goes about 4 times a year to prospecting school. Ray is always learning and going to seminars, he wants to be the best agent he can be! 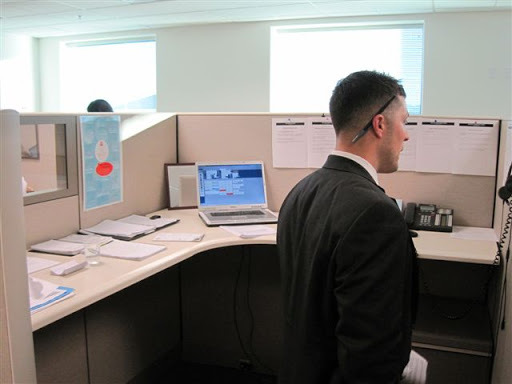 Here is two pictures of Ray last week at prospecting school..
You can see in this picture a guy tapping into Ray’s call and listening in. YOu and Ray are so cute. I'm proud of you guys! Our hubs work so hard for us don't they! I used to be in sales and had to shadow and be shadowed too. I like how he has a big smile on his face:). Way to root for the one you love!